Flaunt your saucy figure in this dainty leather pant which has more oomph factor and girly appeal than your conventional trousers. Wear it with a cool t-shirt and a pair of high heels, and transform your look into a sophisticated and impressive one! 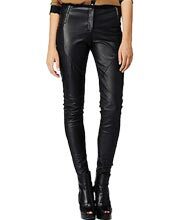 Perfect for all occasions, this skin tight leather pant is sure to win compliments wherever you go!